Cake toppers are as unique as you are. With the world being opened up to us through social media and websites that provide pictures from all around the world and do it yourself ideas, there are more choices than ever. 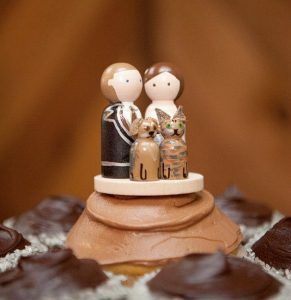 One of the most interesting and personalized cake toppers I have seen were two small wooden people and even smaller cats that represented their pets at home. I found these while doing searches on Etsy – Charlene from Creative ButterflyXOX creates wooden cake toppers and they can even be personalized. You can send her a picture of who you want created and she will do her best to create a likeness for you.Have fun personalizing your next event or wedding!